The Sterkfontein caves in South Africa have been a haven for hominid fossils and evolutionary research. Now, new analysis has been done on the Australopithecus fossil known as Little Foot, pushing back its date to 3 million years old. Over the past 13 years, intense analysis has been conducted on Little Foot by French limestone specialists Laurent Bruxelles, Richard Maire and Richard Ortega who have been studying the caves and erosion. Their research has shown that the flowstone filled voids from collapse and erosion is actually a lot older than previously thought, and this pushes back the dating process of Little Foot from 2.2 to 3 million years old. 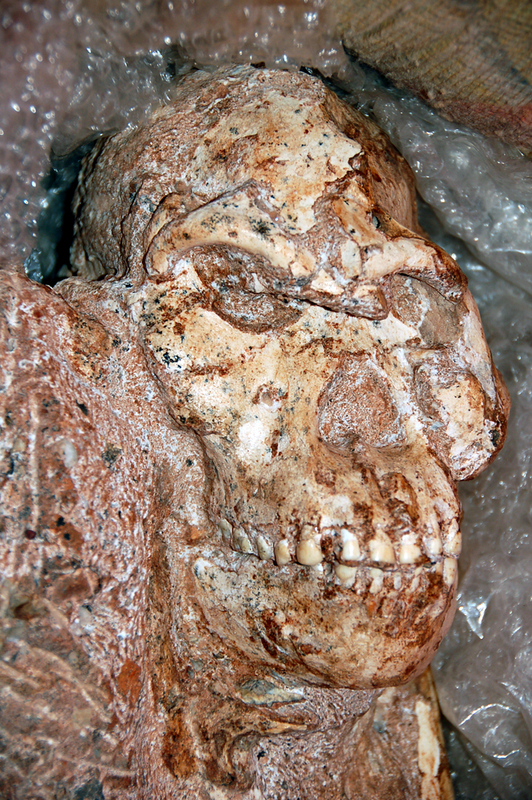 Ron Clarke, one of the founders of Little Foot, and Dominic Stratford from the University of Wits also conducted research into the dating process of the fossil. Studies on the stratigraphic as well as micro-stratigraphic record has created the new reason to refute the previous dating claims. Clarke’s research has been published in the latest paper in the Journal of Human Evolution, this study is explained more in-depth. Little Foot (not the baby dinosaur from Land Before Time) created a stir in the palaeoanthropological world, as it is ‘now’ the oldest complete Australopithecus fossil ever found in South Africa when it was found in 1997. The bones were extremely calcified and encased in rocks, but careful removal has been done to make sure none of the bones were damaged. This removal of the fossils were done extremely carefully in comparison to how excavation was carried out in the early 20th century when archaeologists would use dynamite to extract fossils from encased rock. This would generally damage the fossils as well as ruin the stratigraphic layer it was in for dating purposes. Professor Clarke has since classified Little Foot as Australopithecus prometheus, a name originally founded by Raymond Dart in 1948. This now permits that there were two hominid species that inhabited the Sterkfontein caves over the years, Australopithecus prometheus and Australopithecus africanus.